Texas State Univ. 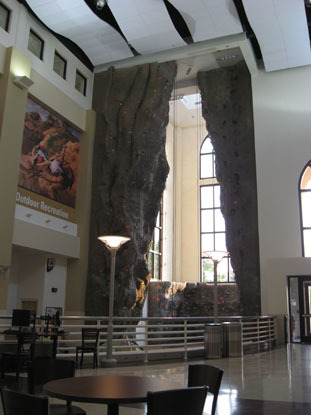 Recreation Ctr. Over the span of a decade, Texas State University's enrollment grew from 21,000 to 30,000 students at its campus in San Marco, Texas. Founded in 1903 as a small teaching college, this dramatic increase in student population reflected the university's ongoing commitment to developing excellence in all areas of academia and athletics. TSU has a strong academic reputation, and its administrators understand the importance of the "work hard, play hard" mentality. To address their expanding campus population and emphasize the value of mental and physical health, university administrators made a $31-million expansion to the Student Recreation Center a top priority. The 96,000-square-foot expansion designed by architect Marmon Mok is nearly twice the size of the original facility and features a new aquatic center and additional space for aerobic activities and weights. Techstyle Acoustical Ceilings by Hunter Douglas Contract were installed in several areas. 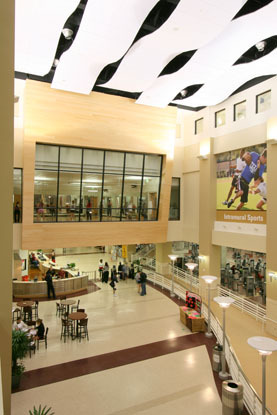 "In a large recreation center with a lot of traffic like that of Texas State University, it is important that noise be reduced within the space," said Ron Rice, sales director for Hunter Douglas Ceilings. "Techstyle ceiling panels are not only attractive, but also provide exceptional acoustics with an NRC of 0.85. This keeps noise levels down so people can enjoy their workouts."